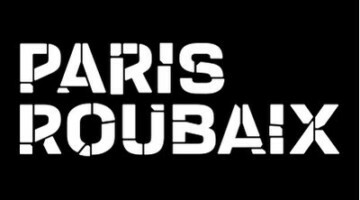 The best male cyclocrosser in the world is a world champion again. 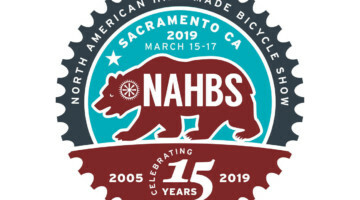 Mathieu van der Poel had a historic winning percentage this season, but all that winning would have been forgotten if he didn't cap off the 2018/2019 season with a rainbow jersey. 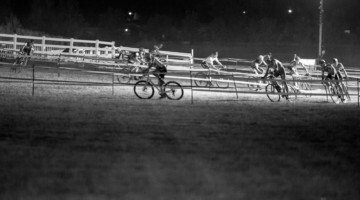 He pulled it off in Bogense, but it certainly didn't come easily. 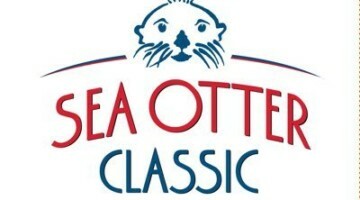 “It was a lot of weight going off the shoulders crossing the finish line," Van der Poel said. "It was a very long race for me. It finally comes together." 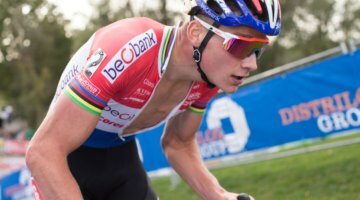 With the win, Van der Poel gets to race the rest of the season and next season in rainbow stripes, settle into the new house he just bought in Belgium, and enjoy the spoils of being world champ again: getting a Cyclocross Magazine profile on his bike. He was even kind enough to hold it up for us. 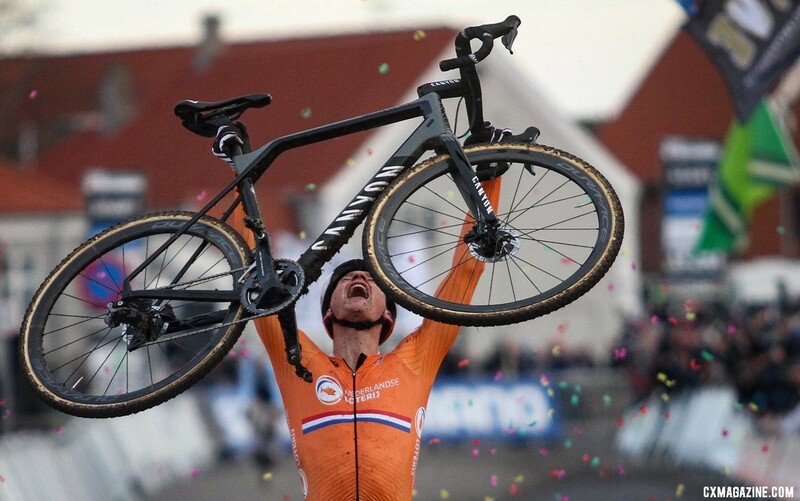 In Bogense, Van der Poel had a gray and black Canyon Inflite CF SLX, the same bike as the one we saw him win on in November at Superprestige Gavere but without the UEC European Champion theme of blue and silver panels. 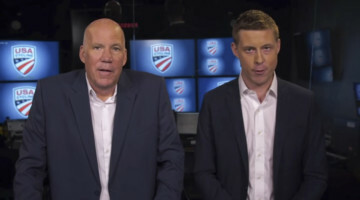 The blue wouldn't match his Dutch national team jersey, so off they went. You can expect that rainbow stripes will be returning in their place. 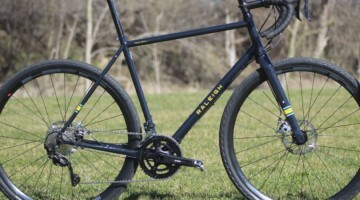 We revisit our recent profile of his bike. 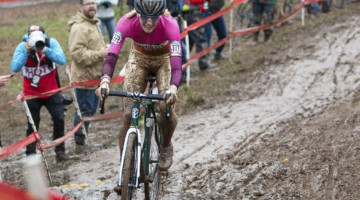 The last time we saw Van der Poel win Worlds, he was on a green camo Stevens Super Prestige. 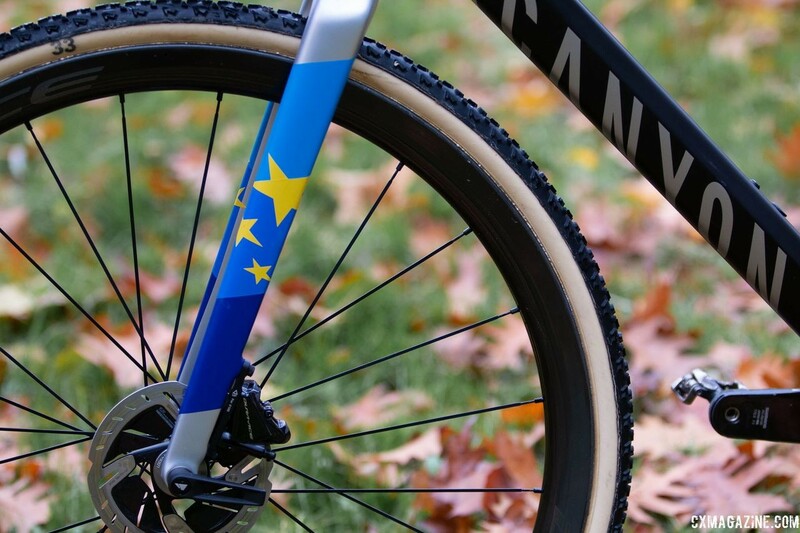 When we saw Mathieu van der Poel go two-for-two at the U.S. World Cups in 2017, he was still riding a Stevens Super Prestige, albeit in different colors. 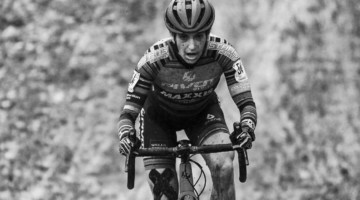 Fast forward one season and Van der Poel's rival Wout van Aert is on a Stevens, while the Dutch phenom and his team have been on Canyon since January 2018. At the start of 2018, Van der Poel and his Corendon - Circus team switched to the Canyon Inflite CF SLX and its hard-to-miss top tube. 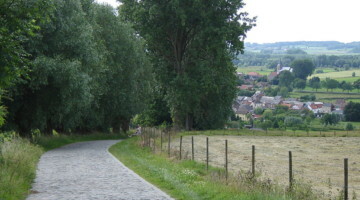 Even with the uniquely designed bike, Van der Poel continued winning nearly every race, with the notable exception of Worlds in Valkenburg. 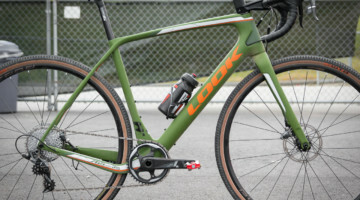 Van der Poel opted out of the 2018 U.S. World Cups after a successful mountain bike season, so we did not get a chance to see his new bike in person earlier this year. 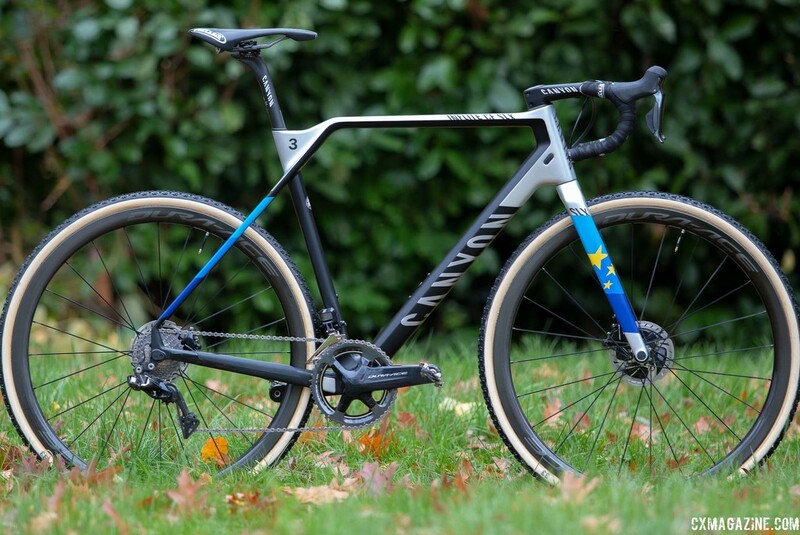 However, at the Superprestige Gavere, we got a close look at what has been the winningest bike in international cyclocross in 2018/2019, and a preview of the bike and setup that would go on to win the 2019 World Championships in Bogense. Starting in 2018, Van der Poel began using Canyon bikes in road, mountain and cyclocross events. 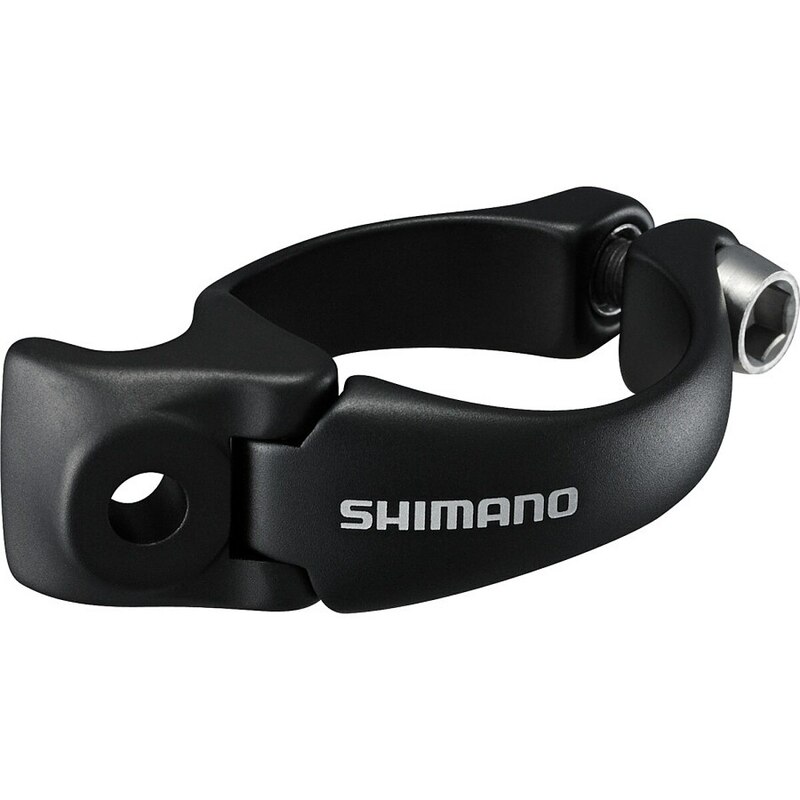 For the latter, he uses the German direct-to-consumer brand’s radically designed Inflite CF SLX. Last year we profiled Lucie Chainel's yellow Inflite and earlier this year, we did an In Review Spotlight of the Inflite CF SLX 9.0. Coming prepared, Van der Poel brought four bikes which are divided into two pairs, one in the red team livery of Corendon-Circus and a second pair in blue which highlights his past as European Champion.  We photographed one of the latter, bike number three. 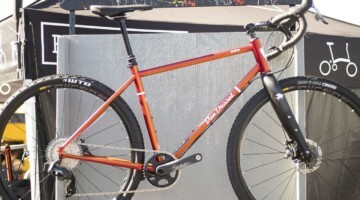 His older brother David also shares the same RV and his bikes are mixed in with MvdP's in the quiver photo. Launched in 2017, the carbon Inflite CF SLX has a distinctive seat cluster that is intended to provide both an extremely open main triangle for shouldering and a low mounted seatpost for comfort. 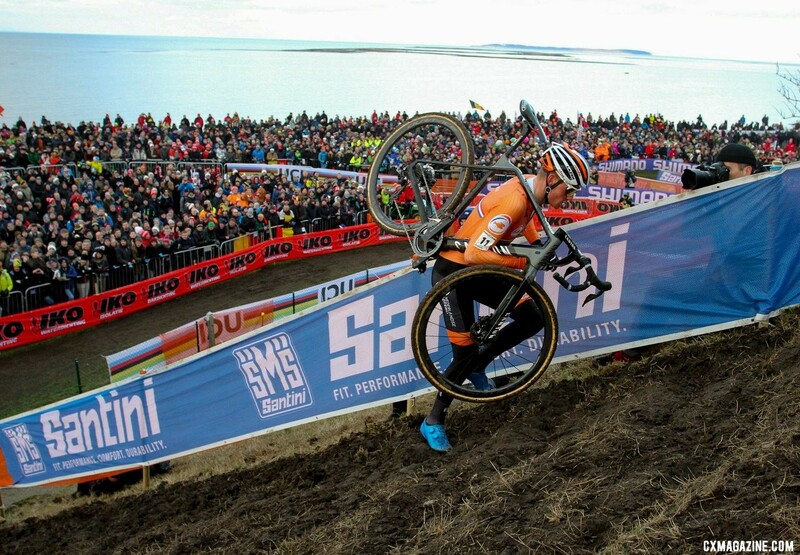 With the multiple run-ups in Bogense, Van der Poel put that open triangle to good use. 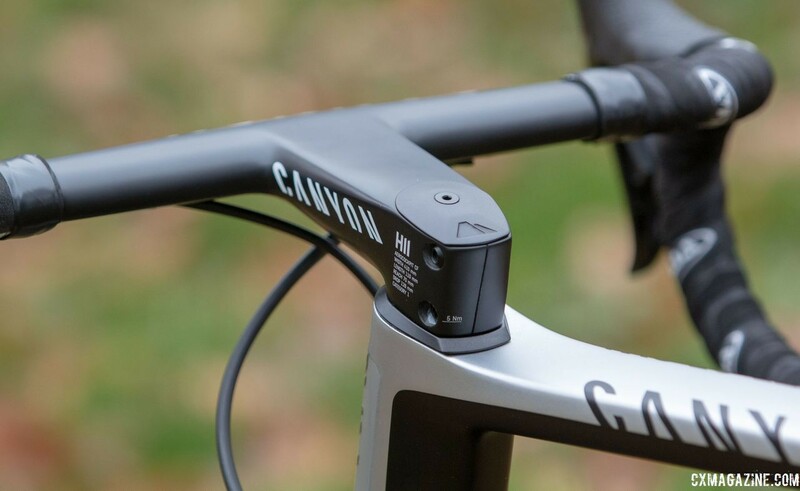 Also unique to Canyon is the 1 ¼” straight steerer tube, which mostly locks riders into Canyon cockpit components. 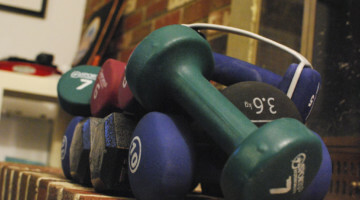 Fortunately, there are several options available to allow riders to tune their fit. 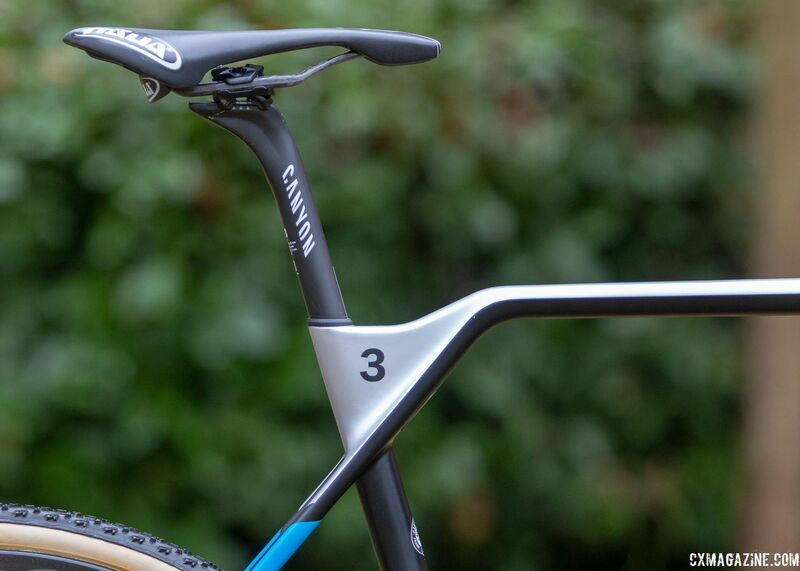 Van der Poel equipped his bike with an H11 Aerocockpit CF integrated bar and stem from Canyon. 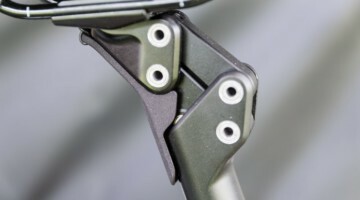 The Aerocockpit has a 110mm stem and 41cm wide bars, the latter of which is a bit different than the 40cm and 42cm models offered by many manufacturers. 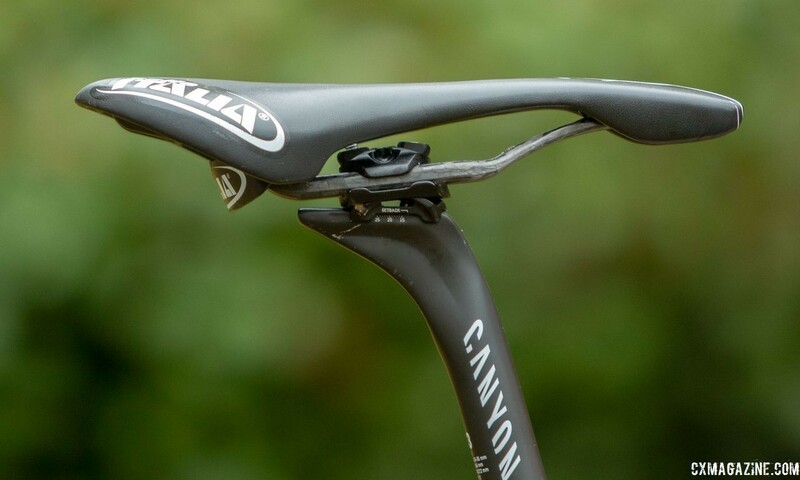 Van der Poel also used a Canyon VCLS CF seat post, which measures 27.2mm and offers variable setback from 15mm to 35mm, atop which he mounted a Selle Italia Flite series saddle with carbon rails. 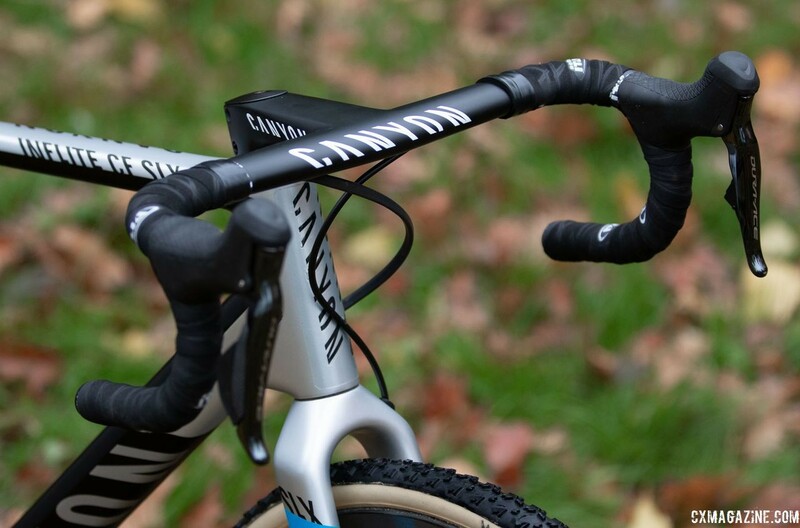 He also utilized bar tape from the Italian brand, even though Canyon offers its own gel tape. As a Shimano rider, it is unsurprising to find the top-end Dura-Ace Di2 R9170 groupset in use on all of Van der Poel’s bikes. 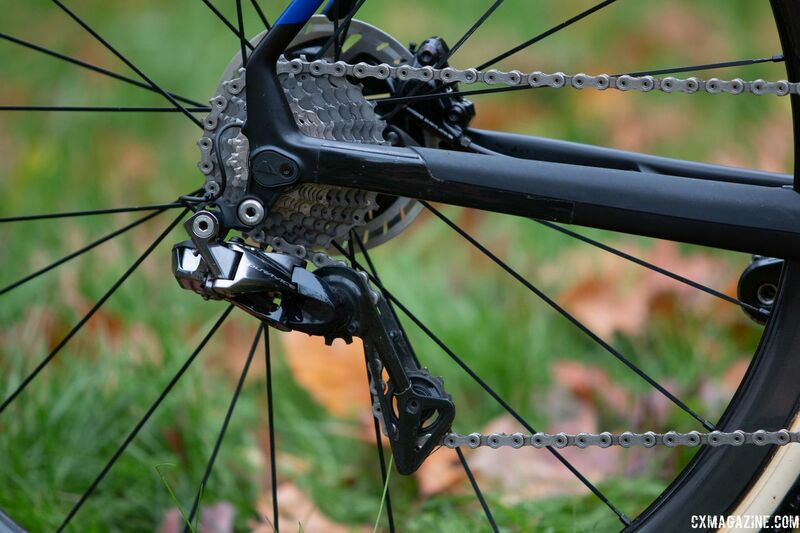 Hydraulic dual control levers power both Dura-Ace flat mount calipers and Di2 derailleurs. Van der Poel used the RT900 CenterLock rotors with the Dura-Ace calipers. 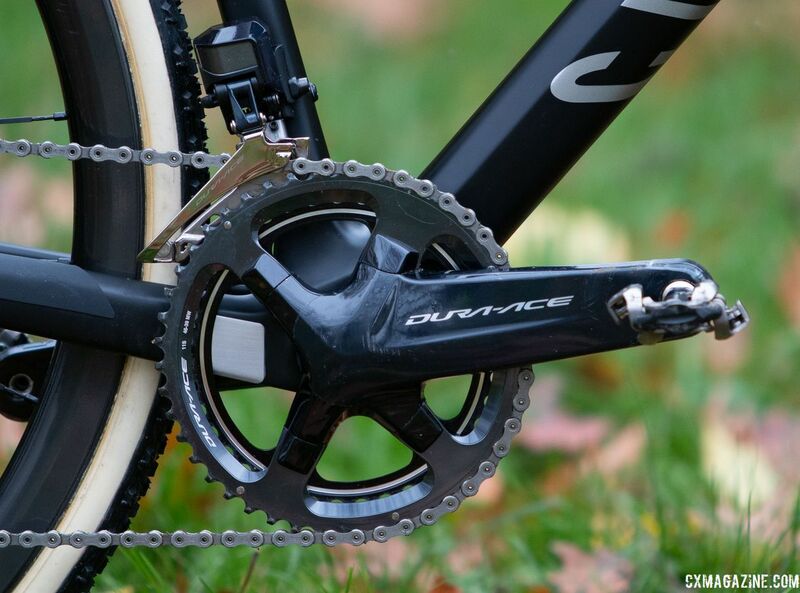 He used Shimano Dura-Ace cassettes and chains as well as pro-only 46/39t chainrings mounted on his R9100 crankset with 172.5mm crank arms. 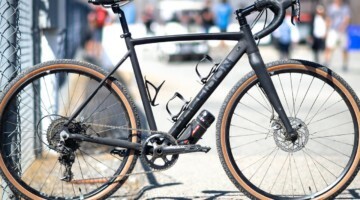 His choice of a double is in line with what we saw many riders do—including Wout van Aert with his SRAM Red eTap setup—but different than Eli Iserbyt on his Ridley X-Night. 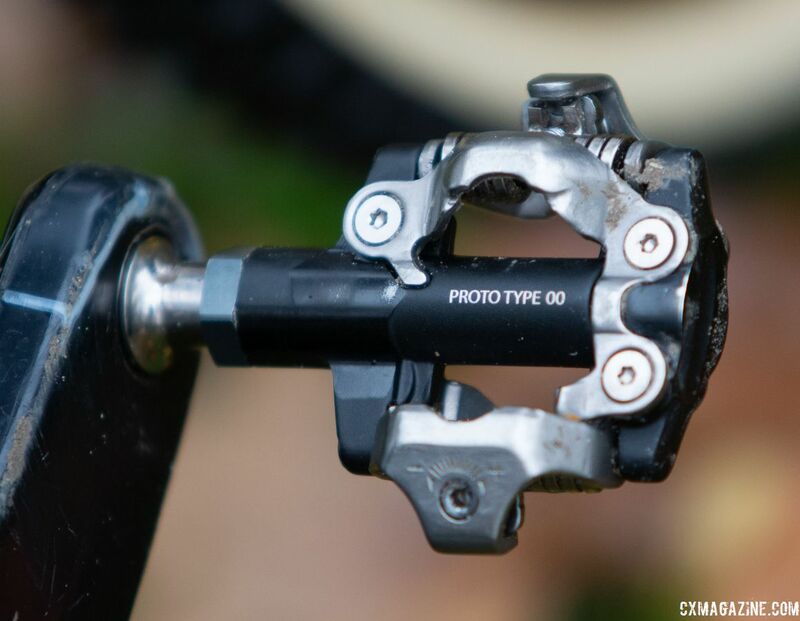 Another pro-only feature is the Shimano SPD pedals marked prototype, which are only available to some Shimano sponsored riders. 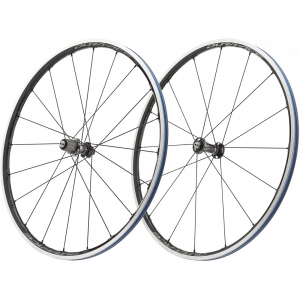 Also unsurprising is the sight of Dura-Ace R9170-C40-TU 40mm deep carbon tubular wheels, onto which Van der Poel mounted Dugast handmade tubular tires. 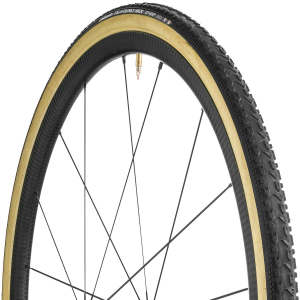 For the conditions in Bogense and Gavere, he chose 700c x 33mm mud tires from Dugast. 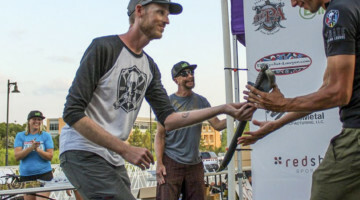 "We rode on Rhino tires and it was quite difficult to make some speed on this course," Van der Poel said after his win. He picked the Rhino tread for the off-cambers, steep climb and tricky turns. 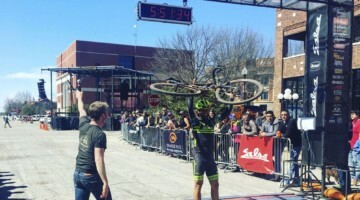 While Van Aert reportedly used the same tires, Van der Poel used the aggressive tread with his world-class handling skills to master the off-camber and take back the rainbow jersey from his rival. 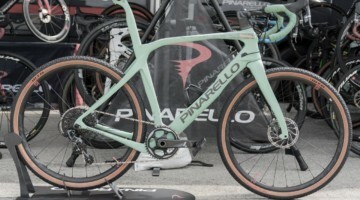 For a closer look at Van der Poel's bike, see the photo gallery and specs below. 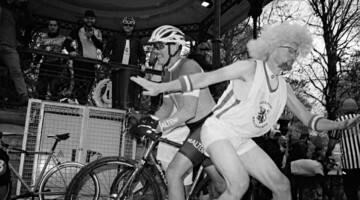 According to the picture his team must have brought at least 8 bikes to Gavere.